"New York City. Friday night. There's a lot of things going on. 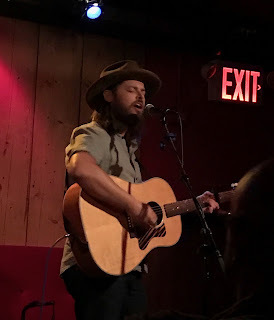 Thanks for choosing this thing," Caleb Caudle addressed his audience in the subterranean Stage 3 of Rockwood Music Hall. Armed only with an acoustic guitar and his twangy mid-range, Caudle began his set by stripping down "Piedmont Sky" and "Tuscaloosa" from last year's Carolina Ghost. He followed with "Trade All the Lights," a fan favorite in which Caudle claims he'd trade all of NYC's luminance to be in New Orleans with a loved one. "No offense," he assured the crowd of New Yorkers at its conclusion. After all, the song was written in a different time in Caleb's life about a woman he's no longer with. He'd explained to me in a podcast interview before the show that even if he doesn't have the same connection to its lyrics as he once did, he realizes that his listeners might, so he has to give it his all for them. The excellent acoustics of Rockwood's basement made it possible to hear every little nuance of the performance, with Caleb demonstrating a soul singer's keen awareness of his spatial relationship to the microphone. In the small room, remarks from the crowd were also amplified, promoting conversation between Caudle and his fans and fostering the kind of intimacy that the venue is famous for. Following "Uphill Battle," Caleb admitted that he'd only just noticed that he'd sung the first five songs with a cough drop in his mouth. He was supposedly battling springtime allergies, but you wouldn't have known it from his impassioned cover of Springsteen's "Atlantic City" that had an Asbury Park-native in the front row swooning like a young Courteney Cox. Caudle also unveiled "Stack of Tomorrows" and "Madeleine," two numbers from his upcoming record, Crushed Coins. If they're any indication of what's on the way, it's gonna be a doozy. The latter ranks among his best songs and was captivating enough that the waitress didn't dare interrupt to take orders for a second round. Caleb finished off the show with a toe-tapping "Borrowed Smiles," not a person in the room second-guessing their Friday night plans. thanks a lot for updating your blog every day! this review is very interesting!